The VNRX-7145 combination is now in Phase I studies to treat resistant urinary tract infections. ntibiotics are the most effective drugs for curing bacteria-infectious diseases clinically. They have a wide market due to their advantages of good antibacterial effect with limited side effects. 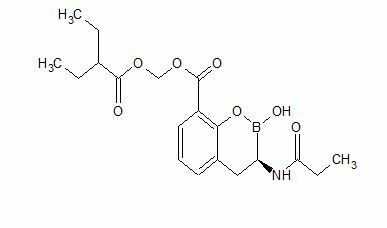 Among them, the beta-lactam class of antibiotics (for example, penicillins, cephalosporins, and carbapenems) is widely used because they have a strong bactericidal effect and low toxicity. To counter the efficacy of the various beta-lactams, bacteria have evolved to produce variants of beta-lactam deactivating enzymes called beta-lactamases, and in the ability to share this tool inter- and intra-species. These beta-lactamases are categorized as“serine” or“metallo” based, respectively, on presence of a key serine or zinc in the enzyme active site. The rapid spread of this mechanism of bacterial resistance can severely limit beta-lactam treatment options in the hospital and in the community. Alternatively, (II) can be obtained by treatment of (I) with hydrochloric acid (around 3-5 Molar in dioxane) in an alcohol solvent such as methanol, ethanol, or n-butanol at a temperature between room temperature and 120 ºC (SCHEME 4). Step 1. Synthesis of 2-Methoxy-3-[2-propionylamino-2-(2,9,9-trimethyl-3,5-dioxa-4-bora-tricyclo[6.1.1.02,6]dec-4-yl)-ethyl]-benzoic acid tert-butyl ester. Prepared from [(1S)-2-(3-tert-butoxycarbonyl-2-methoxy-phenyl)-1-chloro-ethyl]boronic acid (+) pinanediol ester and propionic acid following the procedure in Step 2 of Example 1. The crude product was purified by flash chromatography on silica gel (25-100% EtOAc/Hexane). ESI-MS m/z 486 (MH)+. Step 2. Synthesis of (R)-2-Hydroxy-3-propionylamino-3,4-dihydro-2H-benzo[e][1,2]oxaborinine-8-carboxylic acid. 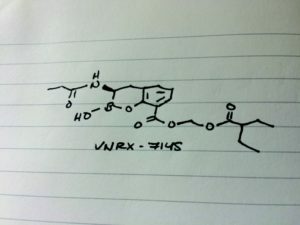 Reporter’s notes: Having unveiled an antibacterial candidate at last spring’s first time disclosures session, Burns was back with another, this time the molecule can be taken orally. Both VenatoRx (pronounced Ven-a-tor-ix) compounds resuscitate the activity of β-lactam drugs, which make up more than 60% of all antibiotics prescribed. Unfortunately, many bacteria have grown resistant to these antibiotics. The new compounds rescue the old antibacterials by inhibiting β-lactamases, enzymes that chew up the antibiotics. 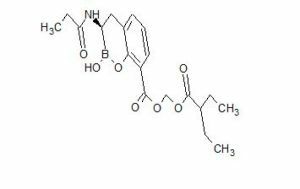 To test the activity of new β-lactamase-targeting compounds, the researchers settled on several “sentinel” bacteria strains. Then to find a candidate with oral bioavailability, the team focused on molecules with low polarity and low molecular weight. 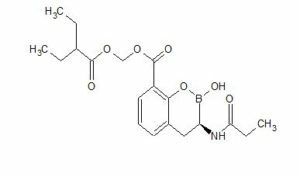 They found VNRX-7145, developed as a prodrug in which esterases in the liver clip off the tips of the molecule to reveal the active drug. 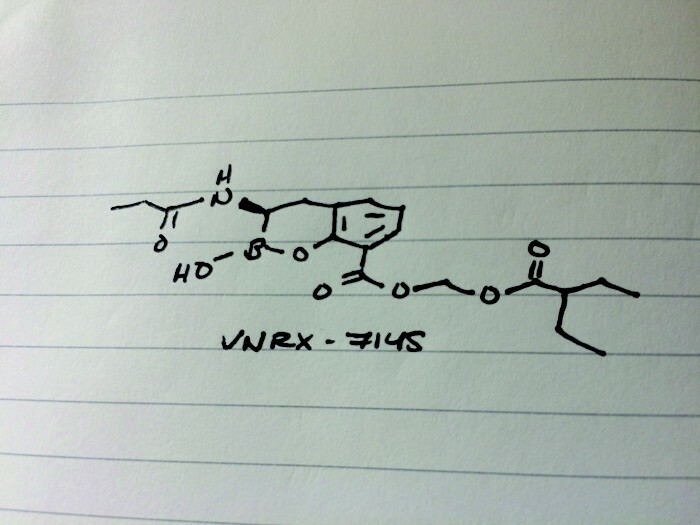 VNRX-5133, disclosed at last year’s meeting, had to be delivered intravenously along with another IV-antibiotic Cefepime, and targeted serine and metallo β-lactamases. The new oral candidate VNRX-7145 inhibits serine β-lactamases with Ceftibuten as its partner. The VNRX-7145 combination is now in Phase I studies to treat resistant urinary tract infections.